It's a great time to be interested in the world of digital displays. A rollable or foldable future is seemingly within reach, and if you just can't wait, there are plenty of fascinating panels already on the market. 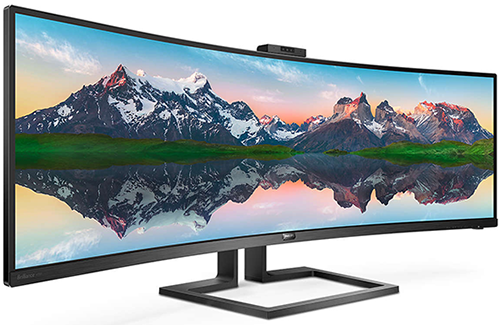 The one's that have really caught my eye in recent months are the mega-wide 49in PC monitors from the likes of Dell, Samsung and Philips. Sounds fascinating, so when Philips offered to send in its £875 Brilliance 499P9H, we thought we'd give it a whirl. First things first, let's preface this editorial by admitting that I'm a big fan of multi-monitor setups. I'm currently using a single 4K display on my work system, and though I can't fault it as such, I don't enjoy it quite as much as the dual-screen configuration that preceded it. The greater flexibility on offer from multiple panels can be a real boon for productivity, and when you get used to snapping windows on multiple desktops or changing one panel's orientation, a single display can feel like a step backward. When you first get this 1,194mm x 568mm x 303mm behemoth out of the box you can't help but grin at the sheer size of it. It's no wider than two individual QHD monitors working in tandem, but by doing away with the central bezel and creating one seamless viewing window, the Philips just feels like it goes on forever. And that's a good thing as the 1,800R curvature seems to envelop the user and create a real feeling of immersion. 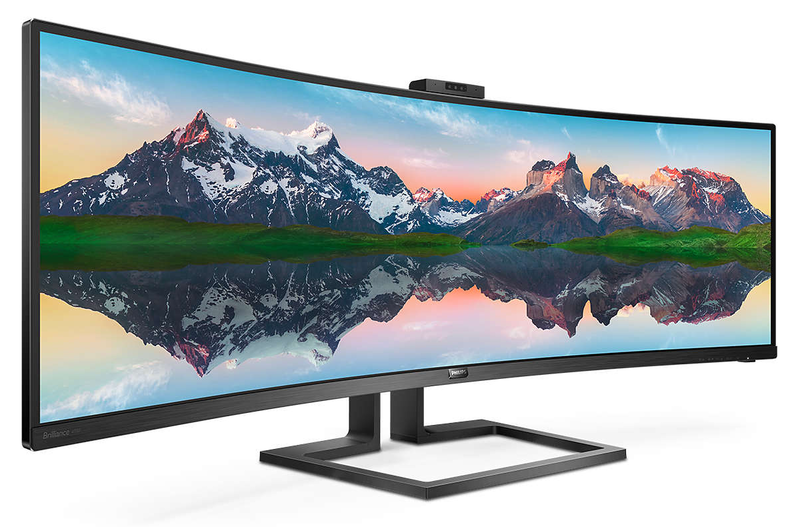 Now I know what you're thinking; wouldn't it be great to play games on this ultra-widescreen beauty? Well, I've tried it, and the experience is mixed. Though the 32:9 aspect ratio sounds marvellous on paper, some games don't render quite right at the native resolution - developers obviously don't prioritise resolutions as niche as this - and even if you do get a game that works perfectly, you'll need a fair amount of graphics firepower to drive those 7.4 million pixels. As you would expect from a VA panel, ghosting is noticeable, and input lag is higher than average, but if you can't resist the occasional game, it's helpful to know that Philips includes FreeSync support in the 48-70Hz range. I wasn't entirely convinced by first-person shooters at this resolution - you end up with an almost fish-eye effect that can become off-putting - but I'm going to contradict my thoughts on the 499P9H as a gaming solution by admitting that Forza Horizon 4 was pretty damn impressive. Racing games just feel better with a vast panoramic view. Gaming or playing movies isn't really what this monitor is about. Heck, even watching regular YouTube clips is weird with chunky black bars either side of the video. The 499P9H is a productivity booster first and foremost, and Philips has put some thought into ensuring the eleven ports lining the back of the panel reflect multiple usage scenarios. Alongside the power connector you'll find two HDMI 2.0b, DisplayPort 1.4, USB-C 3.1 Gen 2, USB 3.1 upstream, Gigabit Ethernet, three USB 3.1 downstream (one supporting FastCharge) and a headphone jack. 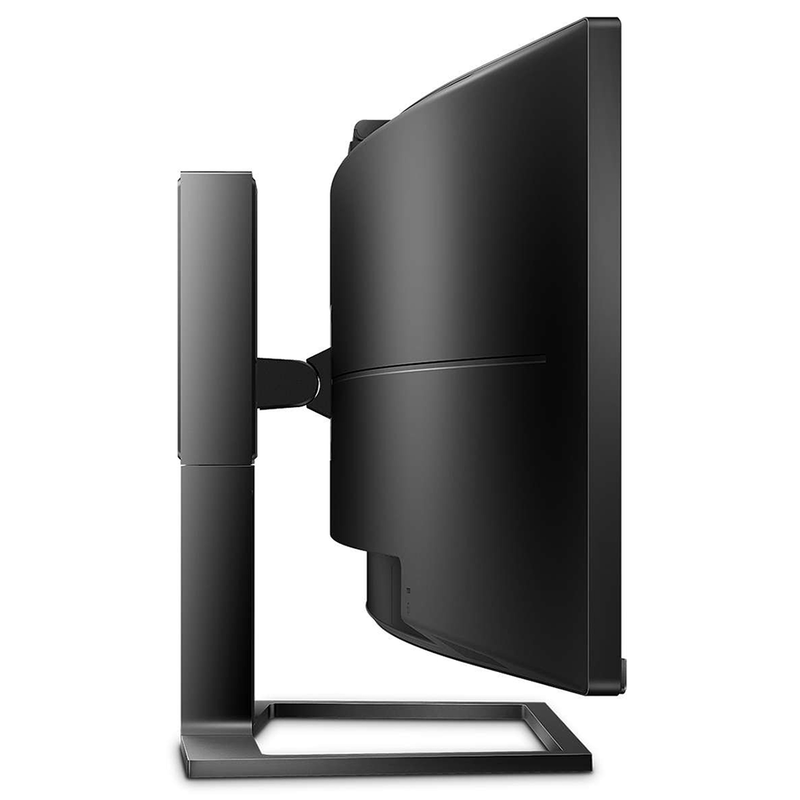 Going a step further, and really opening up the potential of the monitor, Philips includes an integrated KVM, giving the user the ability to control two PCs with one set of peripherals connected directly to the display. There is of course a picture-by-picture mode, whereby two desktops can be displayed alongside one another at 2,560x1,440, and this gets even more useful when you consider the built-in USB-C docking station. In the ideal scenario, you'll have a keyboard and mouse attached to the display, as well as an Ethernet cable for web access. When you then plug-in a modern laptop via a single Type-C lead, the laptop has instant access to the peripherals and data connection, while outputting video to the external display. It is a fine demonstration of what's now possible via a single cable, and better yet, the Philips supports USB-C power delivery at up to 65W, meaning most Ultrabooks will charge while docked. These features work really well in practise, and go some way toward justifying the additional cost of the 499P9H over two separate QHD panels. Having one common set of peripherals for two PCs just makes good sense, and alternating between display inputs or KVM modes is relatively straightforward when using the tactile buttons lining the bottom-left edge. Though the review sample didn't come with any included peripherals, Philips' instruction manual seems to intimate a bundled remote control for even easier switching, and if you're going to be using a certain function on a regular basis, the 'User' button on the front of the display can be remapped to a shortcut of your choosing. The KVM and USB-C docking station are major plus points, yet there are more surprises that you might miss at first glance. At the top of the panel, Philips has integrated a pop-up webcam that supports Windows Hello. The facial recognition aspect works rather well as the sensors are angled down slightly - I was typically logged in within a second or two when sat in front of the display - however the quality of the two-megapixel camera leaves a lot to be desired. The grainy and washed-out image is passable for a quick Skype, but it falls well short of expectations and isn't befitting a monitor of this ilk. Those concerned about privacy will like the fact that the webcam folds back and slots neatly into the monitor's top edge, but Philips, if you're going to go to all this trouble to add a camera, make it a better one. Another small value-add comes in the form of the integrated 5W stereo speakers positioned toward the sides of the panel. They're not exactly audiophile quality and lack any semblance of bass, but they remain clear at high volume, and the fact that they're so wide apart provides rather good stereo separation. An automatic benefit of the display's outstretched dimensions. Philips' feature list is healthy, and there's not a lot wrong with the external design of the 499P9H, either. A thin bezel surrounds the top and sides, the rear isn't too deep despite the integrated power supply, and provided your desk has enough space, the monitor appears both elegant and futuristic. The one element that's possibly up for debate is the stand. 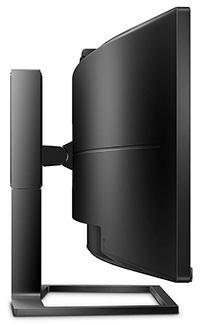 Philips could have opted for a wide, four-legged base that keeps the entire panel planted with little-to-no sign of wobble, but has opted instead to go the other way with a central stand that's more flexible. I like the fact there's 130mm of height adjustment, -5/+5 degrees of tilt plus 20 degrees of swivel, and though you do get some wobble, it isn't noticeable once the monitor is in situ. What is noticeable, however, is the stand's large base, which takes up a fair chunk of desktop real estate and juts out far enough to impinge on keyboard territory. Prefer to use your own mount? The 499P9H is VESA compliant, but do mind the 11kg weight. All this talk and there's barely any mention the screen itself. Offering 109 PPI, the 49in VA panel (or 48.8in, to be precise), touts a 5ms grey-to-grey response time, a 3,000:1 contrast ratio, 94.6 per cent coverage of the DCI-P3 colour gamut and wide 178º viewing angles. An anti-glare coating helps keep unwanted reflections at bay, and the 499P9H also supports HDR, albeit with the most basic DisplayHDR 400 certification. That means the panel meets the minimum requirements for colour gamut and luminance, but this is an 8-bit solution whose peak brightness is rated at 450 cd/m², so don't expect great HDR results. Let's dig deeper into panel quality before reaching a conclusion.